The Rexing F9 is Chinese manufactured dash cam that is just been introduced to the United States. The Rexing F9 is based on is another camera based on the Novatek NT96650 processor and the Aptina AR0330 CMOS sensor. It has a similar size and form factor to the popular G1W. The main difference between the G1W and the F9 is build quality. While the generic G1WX models don’t have the greatest build quality, the F9 has very good build quality with a solid feel. Also the F9’s buttons light up which is a bit unique as shown in the photo below. Video quality during the day is very good and night quality is average. 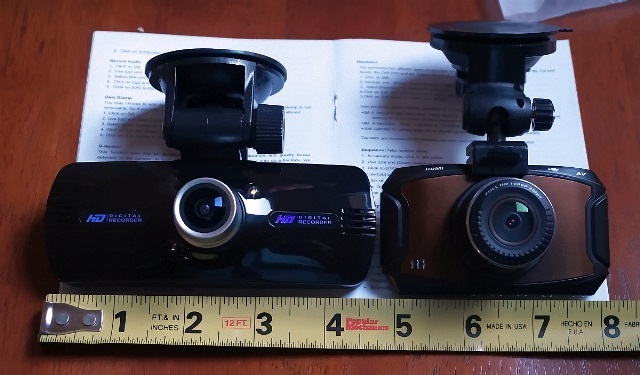 Overall the video quality is slightly better than the G1W cameras and on par with most other Nt96650 + AR0330 cameras. The F9 records 1080p at 30f/s with an average bit rate of approximately 13,000kpbs. The camera comes with a 2.7″ screen but GPS does not appear to be available. The size of the camera is 121mm x 46mm x 39mm. This is about the same size as the comparable G1W. The front is glossy black, has a silver lens and silver lettering which makes it not the most discreet camera. On the positive side, the F9 comes with a suction cup mount and an adhesive mount. Note that their is a full black version available (no silver lens) but one purchaser indicates they received the silver lens model. We would like to thank Sunny from our forum who provided detailed reviews on this camera. The Rexing F9 is really an upscale G1WX with a similar form factor but with much better build quality. Video quality is a bit better than the G1W as well. The biggest negative is the price. Many other great cameras are competing at the $85 price mark including some that are very discreet. Overall, if you like the G1W but want better build quality, the Rexing F9 might be a good choice. Final Word Appears to be a better quality version of the G1W.